The Lack Of Analytics Work Experience And How To Overcome It? Home Business Analytics The lack of analytics work experience and how to overcome it? Are you struggling to clear data science interviews? Not sure how to showcase your lack of data science experience? We have put together a comprehensive course just for you. Come and learn about the different aspects of data science interviews, and get access to tons of videos, hundreds of questions, and plenty of resources in the ‘Ace Data Science Interviews‘ course! One of the most common reasons quoted for rejection of Freshers (or people with non-analytics experience) for analytics jobs is lack of experience! What an irony for someone young wanting to enter the field! They can’t get experience without a job. They can’t get a job without experience! 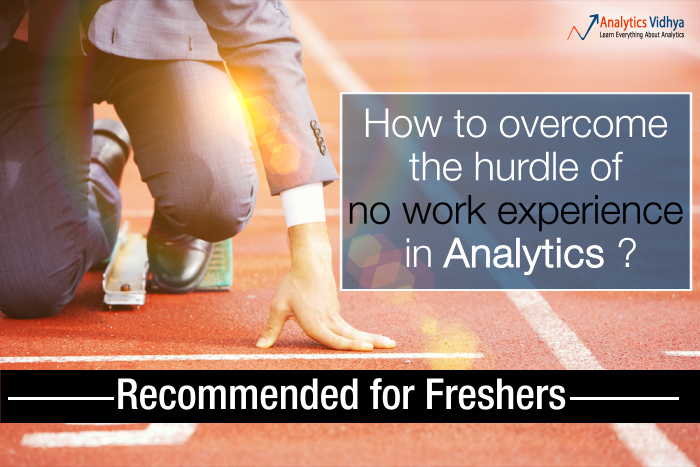 A quick survey of about 20 freshers (trying to enter the world of analytics) I did before writing this article, revealed that on an average, they had been rejected 25+ times due to lack of work experience – even for junior roles. It is dis-heartening to see the difficulty faced by these people! We were expanding our in-house analytics team from 2 members to 5 members. Instead of hiring an experienced professional, we thought of bringing really smart people (straight out of college) on-board. Post their joining, we took them through a very structured induction and training programme and even got them certified from the SAS training institute (all of this, at the cost of delaying important projects for business owners). We were hoping to get loyal and smart analysts, who would pay for these investments through high quality work. 3 months after joining, the first person left to start his own venture. 6 more months later, the remaining 2 people left the Organization to join other companies offering them better salaries! Imagine the kind of costs, the team leader had to bear. Loss of business from key stakeholders, loss of time, knowledge and efforts. To make it worse, they were back to where they started – a 2 member team! I think, he was lucky that he did not get fired! P.S. While I am saying Freshers, what I refer to is people with no analytics experience. Attitude towards work and Maturity in taking decisions – Most of the employers feel that people out of college take immature decisions and need to be mentored on attitude towards work. This is less of a concern with people shifting careers, until and unless there is a specific reason from the past. Time to bring a new person up to speed – An analyst typically takes anywhere between 2 – 6 months to come to speed with the subject. It can easily be a year before you see anything significant coming out of an analyst. Short life span – Because of the demand for trained professionals in the industry, Freshers tend to leave jobs either in search of higher pay or expectation of better role / work. Leaving for better work / role as such should not be a problem, as long as it is actually the case. Ability to learn – People fresh into their roles, typically have higher ability to learn. It might be because of higher willingness or because they have been just out of an environment conducive to learning. No need to un-learn old habits – This is a big advantage with freshers. You can mould them the way you want. You want them to put a framework before touching data – train them in that manner. Try doing it with someone who is in the practice of doing it the other way. Ability to look at everything with a fresh perspective – How good can an analyst be, if he does not ask questions? Experienced people find it difficult to do so, as they may already have a perspective on the subject. Address the concerns of the employers (listed above) and emphasize on your strengths. Start learning analytics early – there is no substitute for hard work and real knowledge. Even if you spend 3 – 4 hours every week reading about the subject, or undergoing trainings at MOOCs (e.g. Coursera, eDX), doing certifications in the last 2 years of your college, you would know more than a lot of people in the industry (at least the theoretical part of the journey). Become an expert on at least one programming language – You can choose the language you want. I would choose Python or R, if I was passing out in near future. Participate in contests – Now that you have the knowledge, apply it! You can participate in coding contests, hackathons or analytics competitions on platforms like Kaggle. It gives you immense learning while you compete alongside the best data scientists in the world. Contribute to these communities – Whether it is your contributions on Github / stackoverflow or Kaggle, all of them will count immensely when scoring a point with the recruiter. Attend events and network with people in the industry – See if your college is arranging some talks / conferences on the subject. Are there seniors / batchmates you have, who are already in the industry? Reach out to them. Try getting a job in companies which are open to hiring freshers / non-experienced people. For example, companies like Mu-Sigma, Fractal, WNS, Citi etc. are open to hire people without prior work experience. If you work on even some of these pointers, you can address the concerns mentioned in the article before. Next, emphasize on your strengths and make a mature decision – no short term decision please! Are you a recruiter / a fresher / or experienced analytics professional? What is your take on this debate? Who do you prefer to recruit? Why? Any tips to freshers wanting to join the industry? Please share them through comments below. Amazing article sir! Thanks you so much. What about people like me after 3.3 yrs wants to get in to analytics??? I am facing same issue like the fresher. No relevant work exp so no job. The practices mentioned in the article are as relevant for you, as they are to a fresher. I refer to both the segments as freshers. thanks for such a motivating article. i am a comp.sciences graduate , i have been wanting to make a career in data analysis . i went through informatica training but with no luck wrt to job. i have 6months exp. in development field .net in particular. my key interests are lies in oracle and informatica etl architecture itself..
please guide me through my decision..or if you can suggest anything more productive . please kindly let me know .ill cherish that guidance all times. You can go ahead with higher education, but search for other institutes, apart from Amity. Also, you should check out about their placements, before taking a plunge. Thanks alot sir for ur guidance.m searching for alternate options for a better institute.. Thanks Kunal, very beautiful and helpful article for freshers. Post 2 years, I changed my competency and entered a project which comes under Analytics but have found that we are moreover focused upon reporting only. Major part of my job included SQL & VBA with reporting being done on Excel. Now , I want to work on some pure analytical projects but whenever I ask for it, senior members check the past exp and I am not getting any opportunity as such. To achieve my goals, I have start learning SAS and am planning to go for L0 SAS soon. Can you please guide me what else could be done to choose the correct path towards future. You are going in the right direction. However, this is just the start of journey for you. You should aim for the predictive modeler certificate rather than L0, if you really want to work on advanced analytics projects. The points mentioned in the article are all relevant to some one in your shoes as well. Nice one but what about a six to seven years professional with no analytical experience ? The article is as relevant for you for the action items, as it is to a fresher. In addition to this, you should also read this article. Thanks for the suggestion. We understand the need of advanced training and are looking at ways to address the need. Stay tuned for more updates in future. I am a fresher with good programming knowledge in SAS. I want to get into analytics field .Being from a BTech background i have good.programming knowledge.Plz suggest me how to go further in this path. As being a fresher there are no relevant course offered by institute in analytics..
Where have you done your B.Tech. from? Have you been placed somewhere? As a starter, you can follow our blog alerts by liking our facebook page or following us on oue twitter handle. Where are you working right now? How much experience do you have in total? Regret the late reply. As mentioned in the article, you should pursue business analytics out of passion and interest and not because you are looking at changing career. I am very afraid about the program which is scheduled on 1st June on Analytics for Beginners, as i wouldn’t be able to attend because of some financial reasons. Can you please let me know when Is the next batch for this course also can I utilize this discount coupon next time. Kindly suggest. There are batches starting from 15th June, 1st July and 15th July. You can take up which ever you want. This coupon code was a one time release. If any other coupon is released, I’ll inform the subscribers of the blog…so stay tuned. Thank you for taking efforts to write these articles. It is really very helpfull. Nice articles. U have highlighted what the fresher’s (applies mostly to ppl striaght out of college) should do. But what about those ppl with work exp of few yrs n wanting to make career change into analytics. They r also treated as fresher’s n are rejected way before even being called for interview in spite of having willingness to learn n also contribute in the organization thru past experience. Companies should, at least, give such professionals a chance before concluding as , not suitable’ for the job. Thanks for the note. The article actually applies to both – freshers and people with experience in other domains. If your experience is into completely un-related field, you will be treated as fresher. However, if you have domain experience or you have some IT experience, you will be give some advantage of the work experience. Following some of the above would really help. Have seen so many people with interest in this area without any idea of what it is all about. I need your help regarding the analytic career that I intend to start after an stint of 3.4 years in an IT company. With a view to get into analytic I self learnt Base SAS and completed the certification this month. However now I am puzzled about the next move that will take me close to analytic. I am not getting any project relevant to SAS in my present company. I can switch but do not want to be just a SAS programmer. Can you please guide me what should be the next step after base sas. I think of getting into predictive analytics. And as i am not from commerce background what statistics fundamentals should I learn. Any other suggestions? 1. You can go for a predictive modeling certification from SAS Institute. The certification is valued highly in the industry. If you have the budget, the course from SAS costs approximately 80k for a 6 day course. 2. If it looks expensive, you can look at learning stats from Statistics Course on Udacity. You can also look at the course we are running on Internshala. The problem would still persist. Beacause Theoretically I might be excelling in SAS and predictive courses but I might be up to the mark practically. Apart the link you shared doesnot open. Please suggest me the stat content I need to master. Predictive modeling course is a very practical course and hence it would narrow the gap between experience and practical exposure. Regarding stats, you need to start with probability, distributions, hypothesis testing and t-tests. You can check out statistics course from Udacity. You could find the people you need if you would consider older (>50) technical professionals. Just because they graduated from university 30+ years ago with technical degrees, they have the fundamentals and experience to tackle any fresh task. I think you are worried too much that experience taints quick learning. No one is saying that we should not hire people with experience. However, at time of hiring, they can not be treated at par with people with more work experience in data analytics. Because of their experience, they can come up the curve faster. But only time can tell that. I am a Post Graduate Student in Statistics.My couirse will be over this month. I would like to enter Analytics field. I learned some softwares (Preliminary) like R.MATLAB, SAS etc. Can you guide me what to do next for a best Career? any oppurtunities available for freshers? Please go through the article, it already mentions enough action points. I am Hadoop/big data developer in BI / DWH ,good exp in Hadoop all eco systems, now i moved to predictive analytics,mahout recomendation engine. currently am learing R, i totally depended on R only.because of Open source, could you please guide me in R predictive analytics, my analytics are in retaile domain..
thanks for your response.i have a use case .i have data with productid,customerid,orderquantity,day of month. i need to forecasting the order quantity of customer in product wise in next oreder.is forecasting possible dynamically ,because i have lot of products ,so i want predict the future demand of each customer for all products. am i going wrong..could you please guide me. i am in basic level. Very good article!Could you please guide on how to get exposure to actual project work without the work experience. I understand there are various sources available for theoretical learning (like courser, EDX) which provides excellent learning material that too free!. But I am not able to get my hands on an demo project where I get tot know the end to end lifecycle of an analytics projects and how they are executed.Thanks in advance. what exactly is thec work done under reporting and querying? How you corelate analytics with market research? I need your guidance in getting job as Business analyst, currently i am working with leading private sector bank (from may 2011 till date) in Hyderabad , in Mortgage(corporate) loan portfolio team, and i am a b-tech(electronics) graduate 2008 passed out. kindly help me by resolving below mentioned quires. 1) I want to learn SAS before applying for ISB certification course, learning SAS is enough or do i need to do certification also is there any other course do i need to learn ? 2) Also planing to take foundation course in analytics from Jigsaw academy will it fetch any job opportunity as BA, as this academy advertising placement assistance. any other suggestions to switch my self from back end manager to business analyst. I worked as Cognos reports developer for 3 years then I took a break of 3 years for maternity, not I want to get back into BI. What do I do, Please advise. I passed out from college in 2013, B.Tech, ECE. In Jan’14, I joined Cognizant and left in June. I joined Jigsaw Academy, Fundamentals of Business Analytics Course and have completed it recently. And now I am pursuing Data Scientist and Big Data Specialist course from Jigsaw. I had taken all three courses in August itself because I had completely made my mind to get into Analytics. A fresher, but with some hand on experience of Predictive Analytics owing to 6-7 Case Studies I have done in the Fundamentals Course. Today, I am joining a Big Data Analytics Firm called Trendwise Analytics as an intern, to get some real business experience of Analytics, till I get a proper job. Actually, Thank You!! I came across the opportunity at Trendwise Analytics through your portal only, and capitalized on it. 1) Though authorities at Jigsaw Academy have told me they will arrange a few interviews for me. But I want to fast track my job search. How to do so? I have sent my resume to “[email protected]”. Subject: “Resume- Abhishek Kumar.” Please review it and provide some help in finding a job. 2) I have interests in Banking and particularly Investment banking domain. And as a fresher, should I focus on getting domain specific Analytics job or should I target niche Analytics company which offers cross domain experience in Analytics. 2) With long term objective, Should I go for some internationally recognized Global Certificates like “SAS Certified Statistical Business Analyst Using SAS 9: Regression and Modeling” or “SAS Certified Predictive Modeler Using SAS Enterprise Miner 7” or any other certificate. Is it right time for me to go for a certification or should I wait till I get a Job. If I should should go for a certification, then which one do you suggest? I do not have relevant experience. Do you think a Masters degree will be suitable for me right now? I have received admits from a few universities for Business Analytics. I’m not sure if I should take it up. Very good article. I think “Attitude towards work and Maturity in taking decisions” is the biggest reason companies don’t want freshers . fresher’s hop very frequent unless they are bound by any bond. hey……..great article. I am pursuing B.com(H) from DU and want to shift my career in analytics because i have done 2 month internship in R where i really liked the concept of data mining and that’s why i am looking to kick start my career with Data science certification course of jigsaw academy. But, I just want to ask that being a commerce graduate will it be difficult for me to find a job as data analyst or business analyst? because i have seen that most of the company prefer to take BE/B.tech student. so, please suggest me something. very good article,I want to get into analytic field .Being from a B.Tech background i have knowledge about sql and vba .I did SAS base and advance training, but in my current company i am working as MIS reporting in excel.Please suggest what I have to do next for career in analytic. Thanks in advance. Thank you for the article. I am facing exactly the same situation. I have done my post graduation in operations research and computer application in 2005-2007. After that almost 4+ years I was working with a private IT firm in kerala itself as a software trainer. And as my family is here in dubai, I left my job and came to dubai in 2012. And I am looking for a job here as business analyst. But I am going through the same situation which you mentioned in the above article. I hope u could guide me. As you mentioned in the article I am looking a company who hires freshers or something like internship. Once I approached citi bank here in dubai for an opening. But they said they are not hiring person in direct. Only I can do is join with their sales team which they have outsourced. So please help me sir. Should I do any online course or can I get any tutorial as I am here in dubai. I appreciate this article very much as it is very close to my past experience. I’m currently working in an analytics startup, but the path was extremely difficult considering my non-computer background and lack of analytics experience. I gave all my time and efforts to learn analytics from scratch for more than 1.5 years. I did several part time internships during college to get accustomed to real data and also participated in competitions. I even compromised on my CGPA and didn’t appear in campus placements. Working in analytics is an absolute pleasure and it’s definitely worth the risks I had taken. Kunal Can you help me out in letting me know what all companies are there which hire Freshers(no experiance in analytics) ? I did SAS and R language course from a reputed institute in Analytics last year. up till now I don’t feel confident on any of these skills set such as running queries,modelling and analyzing data and other questions asked in interview. what should i do, should i look for some extra questions or tips to improve the same.